Learn to draw stylized stick figure animals in this art-venture! In Stick Sketch School: An Animal Artventure you'll draw animals from the jungle, Arctic, and even extinct & fantasy creatures! Since Billy Attinger founded his company, Stick World, pop culture has exploded with stick figure art! Social media feeds and other online resources are the perfect home for this brand of simple, pithy, and often wickedly funny art. 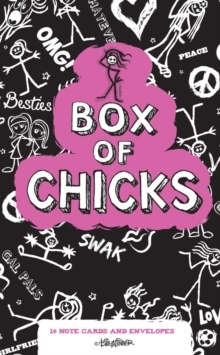 The best part about stick figures is that anyone can draw them!Billy Attinger showed how to draw stylized stick figures in his popular Stick Sketch School, and now he's back to show the world stick figure animals. Take an "artventure" around the world: learn to draw stick animals in the jungle, the Arctic, the rainforest, the Outback, underwater, and more! 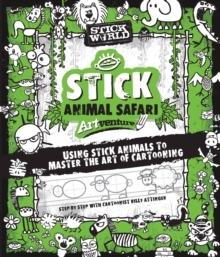 You'll even learn how to draw extinct animals and fantasy animals in stick form. This guide to drawing is perfect for the visual learner. Each spread features a grid on how to draw the lines, how to add movement, as well as expression. 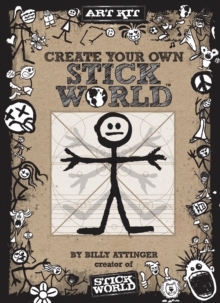 You will also get tips and tricks from stick artist Billy Attinger himself on how to make your stick animals personal, recognizable, and unique!